Mary @ Little Red House is hosting Mosaic Monday. There are already a ton of participants to check out as I am a little late getting this posted. This could take all day. Some of you have been following my Santa a Day posts for 2 weeks now. Here is a glimpse of all of the ones posted already. I assure you there are many more to come. 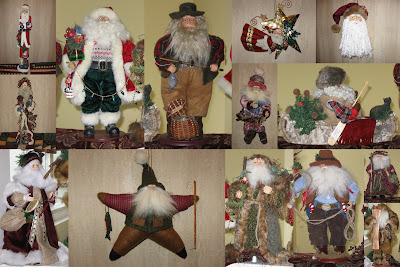 I am all about the Santas at my house for Christmas. I have loved your comments especially the ones referring to a couple as Grizzly Adams and Gabby Hayes. Too bad you're several provinces away - you would enjoy our Christmas concert this year! Well, now, I am going to have to learn how to make me some of those mosaics, aren't I! Love your Santas..Better you should have that collection! I can enjoy them w/o having to store them! Your Santas are cute! Neat idea for mosaic! Love the mosaic you made but I'm a Santa person too so it's right up my alley!